Shwetaung pagoda is located on the hill which is 300 feet high and half a mile away from the east of the palace site. The pagoda is the solid conical structure. The future Gaw Ta Ma Buddha lived in the mountain as a king peacock in a previous life of his to fulfill his minor perfection. The name of the mountain is Gandagiripatpada. King Thu Ri Ya Sak Ka in Dynyawaddy period, built a pagoda enshrining the head relic of Buddha in the pagoda according to the prophecy of Buddha. After fall of Laungkyat, king Min Saw Mon looked for a place to found the new city. When he was looking for it, the earth deity pointed out the place of the new city from Shwetaung mountain by wearing the white clothes. 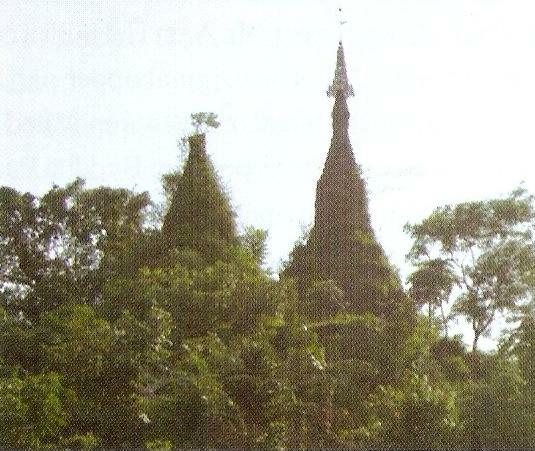 When king Min Saw Mon founded Mraukoo, he renovated Shwetaung pagoda as well as five city-settlement pagodas. 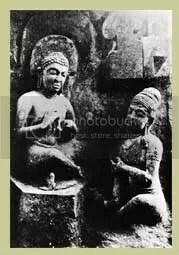 In the regime of king Min Bar, a yogi called Zawgyi made the soil of Shwetaung to be gold by blowing bellows it. King Min Pha Laung donated the whole pagoda the golden robe by embellishing it. In the past, the brick staircase was made from the base of the mountain to the top. The mountain is surrounded by the brick wall in four directions not to fall from the top of the mountain. Paunawtaung fortress and Myattaung fortress exist near Shwetaung mountain.